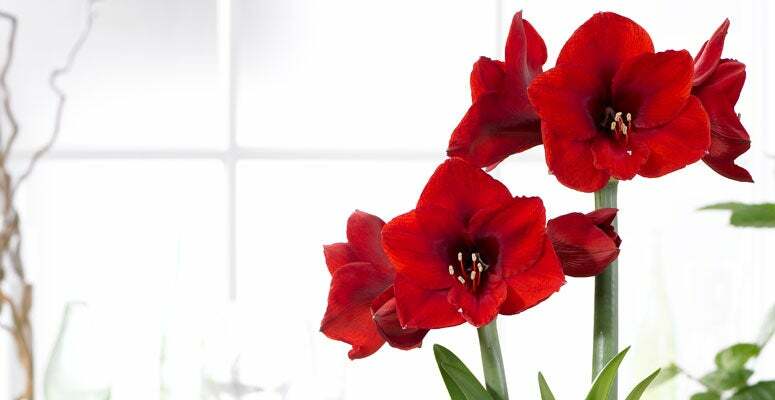 Amaryllis Red Lion is a favorite variety for indoor holiday blooms. Amaryllis bulbs produce wonderfully showy and long-lasting blooms, with the individual flowers as large as six-to-eight inches across. They are a favorite of gardeners and non-gardeners alike—they’re that easy to grow! 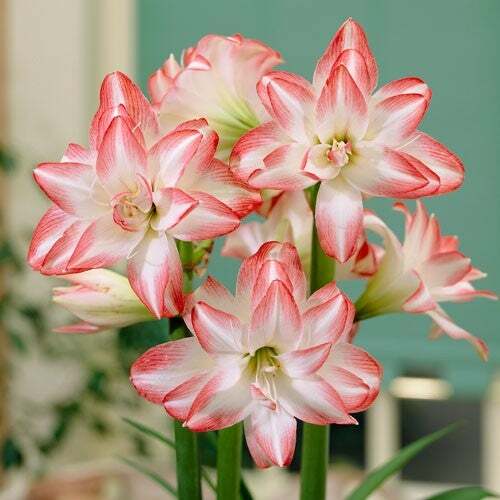 Amaryllis make wonderful gifts and will produce showy, magnificent blooms in as little as 6-8 weeks. If you stagger the plantings, you’ll assure yourself weeks and weeks of stunning blooms. If you want blooms for the holidays, plan ahead and get them potted in mid-October. Follow these tips for growing amaryllis, and whether you’re a novice or expert gardener, soon you’ll have big, beautiful indoor blooms. The Amaryllis bulbs we sell are the largest available, and are similar in size to a very large onion. Our bulbs are likely larger than those you might find in a “big box” store. Our customers prefer the larger bulbs because they produce more stalks and bigger blooms. When planting your bulb, select a pot that allows about one inch all around, and at least two inches below the bulb. Don’t worry, they don’t mind crowding! You can use a good quality soil-less potting mix or a blend of one part peat moss and one part coarse sand for planting. Make sure to not plant too deep and leave the top of the bulb ("shoulder') just slightly above the soil. Water in your newly planted bulbs thoroughly, but don't water again until the new sprout is well out of the bulb. Once you have a sprout a few inches long, water regularly and soon your amaryllis will produce its spectacular, huge flowers. Remember to turn the pot regularly to make sure the stalk grows straight, as these bulbs have a tendency to grow towards the light. In most of North America, amaryllis are only grown indoors in containers. Amaryllis are native to the Southern Hemisphere (South America and southern Africa), and can be grown outdoors in warmer, frost-free zones. If you live in the southern U.S. (zones 9-11), you can plant these bulbs in September or October. If well cared for, the bulbs will continue to flower for years. 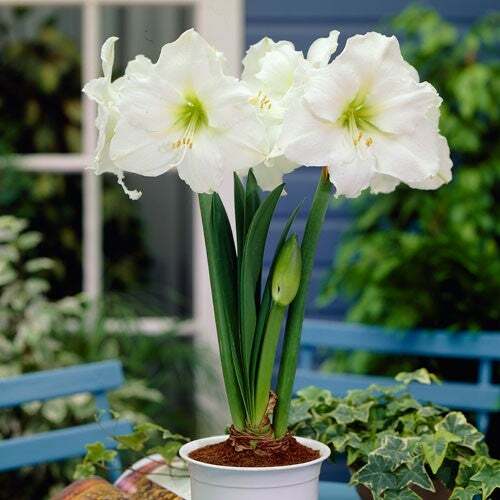 Amaryllis Christmas Gift is a pure white variety with a light green center. Once your amaryllis flowers have faded, cut the flower stalk back to the top of the bulb. Keep watering and fertilize through the spring/summer. You can move the potted bulb outside in a semi-shade spot or grow it indoors in a sunny window. There are two ways of preparing the bulb to re-bloom. - Let them continue to grow until them begin to turn yellow (around early fall). Cut the stem and leaves back and dig your bulb up to refrigerate it. Clean the bulb off and store in a cool refrigerated place (ideally 40-50 degrees) for a minimum of 6 weeks. After the 6 weeks bring them out, re-pot and they should bloom again within 8 weeks. - Or leave them outside into the fall, but stop watering in early September and cut off the foliage as it dies back. Bring it inside just before the first frost, and repot the bulb if it has grown to fill the old pot using the measurements above. But keep it dry until late October. Then begin watering the bulb in November to bring it back to life and start the winter bloom cycle yet again.